Juha, the “wise fool” of Arabic folklore, offers a playful escape from reality, while also communicating societal values. Juha the “wise fool” is well-known and beloved throughout the Middle East and North Africa. Tales of Juha have also spread beyond the MENA region, with versions of the character appearing in Turkish, Iranian, Italian, Romanian, and Jewish Sephardi folklore. Juha’s playful wit and flouting of authority contrast with the parental wisdom embedded in another set of folk tales, the fables of Luqman. 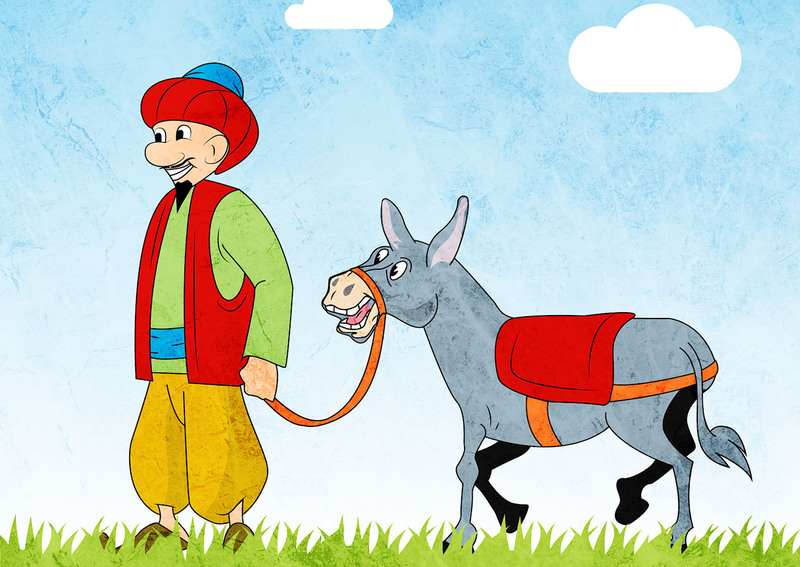 Luqman, a compiler of stories who shared many fables with the Greek Aesop, is venerated in the Quran for giving sage moral and religious advice to his son. Luqman’s stories present ways of dealing with the hard facts of the world: pride comes before a fall; you should always examine things before you step into them; and being greedy can lead you to lose the good things you already had. The moral of these stories is often to be prudent and to practice moderation. Juha, on the other hand, lands himself in dangerous situations through his candor. He refuses to censor himself, but also makes his criticisms no more aggressive than they need to be. Juha and Luqman convey morals and societal values with very different voices. While Luqman speaks from the perspective of a parent, Juha allows us to step momentarily into a more childish perception of the world. When we consider the morals children could take from this story, one might be that we sometimes have to follow rules we find unreasonable, simply because they are the rules. But the Juha stories diverge from Luqman’s in that the conclusion of this story is not advice to be taken literally. Of course, we know better than to express out loud all of our irreverent thoughts, but Juha’s wit allows us to experience vicariously the joy of expressing criticism without suffering the consequences. Luqman’s fables and the Juha tales present a similarly lifelike version of the world. Both fall outside the fantastical genre of fairy tales that present a stark binary construct of virtue and evil. In the stories of Luqman and Juha, characters are often greedy and selfish in a mundane way, and sometimes they mistreat others simply because they are “having a bad day.” Luqman’s fables follow the rules of the normal world (with the exception of certain talking animals) all the way to their conclusion, where they impart realistic guidelines to avoid danger and succeed in life. In the Juha stories, the premises are as realistic as Luqman’s, but the rules of Juha’s world diverge from our own when it comes to his irreverence. But every time a fig hit the mark, Juha would cry out, “May Allah reward you with his blessings, dear neighbor!” or “Allah grant you many sons and abundant riches, dear neighbor!” The prince’s curiosity finally overcame his anger, and he asked Juha why he was saying such things. “Sire,” replied Juha, “I was bringing you a basket of the largest turnips you have ever seen, white and sweet as apples, but my neighbor told me that figs would be a better gift. Should I not thank the man who saved my life? Had my basket been full of turnips, every bone in my body would be broken by now!” The prince laughed, and regaining his good humor, sent Juha home with a purse of gold. Remarkably, Juha’s wit is sufficient enough to snap the prince out of his bad humor; the tale ignores the possibility that the prince might decide to chop Juha’s head off instead. Talking back to a prince in real life probably would not end well such would be the prudent advice of Luqman when he recommends keeping your mouth shut about matters that do not concern you. The story of “Juha and the Basket of Figs” does not illustrate the real-life consequences of cheekiness. It allows us to experience a momentary suspension of the law of consequences of which adults are aware, and that children listening to these tales are also beginning to learn. A countryman who enjoyed hunting once visited Juha in the city and brought him a hare as a present. Juha took the hare to his wife, had her roast it in the way he most relished, and invited the hunter to stay and share it with him. Some days later a man knocked at Juha’s gate. “Who is it?” he called. “A neighbor of your good friend the hunter, who brought you the hare the other day,” the man shouted up. Juha asked him in and let him rest and set a meal before him most hospitably. Not long after this, another stranger in country clothes called on Juha. “Who are you?” asked Juha. “I am a friend of the neighbor of the hunter who gave you the hare.” “Welcome, welcome,” said Juha, and led him inside. When the guest was comfortably seated, Juha placed in front of him a steaming bowl of hot water. “What is this?” asked the stranger. “This water was boiled in the very same pot as the hare that my good friend the hunter, whose neighbor you know, brought me,” said Juha. At the same time that he offers this satisfying leap into our id, Juha reinforces a set of social values. There is a distinction between rules that we are allowed to transgress in fantasy and rules which even in the fantasy world remain important: hospitality, basic respect, and good humor. The second set of values emerges from the stories strengthened because the stories give us an opportunity to experience vicariously freedom and a rectification of injustice even while these values remain intact. Juha rejects a posture of deference while maintaining an attitude of basic respect; he is blunt but never cruel or vindictive; he refuses to let others take advantage of him, but adheres to societal norms around hospitality. At first glance, it might appear that Luqman is a moralist while Juha merely offers a playful escape from the rules. In fact, Juha’s stories communicate societal values as strongly as Luqman’s. While Luqman’s fables provide a comprehensive body of advice, the morals of Juha’s stories reside in the delightful personality of Juha himself. His consistent good humor, commitment to fairness, and respect for the importance of hospitality stand out all the more in light of his carefree attitude toward other rules. The Juha stories show us that fantasy and morality are not mutually exclusive.